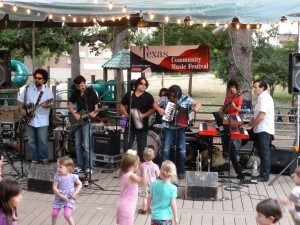 Austin — The Seventh Annual Texas Community Music Festival resumed Saturday with a program as diverse as Austin itself. Another packed house spent the afternoon and evening amid sunny skies and pleasant temperatures and heard some old favorites and newcomers to the TCMF. The day began with NUMBERS, a Dixieland ensemble composed of Math teachers from Austin Community College. After them came the fourth annual a[[earance by the Hill Country Community Band of Marble Falls, followed by a most unusual and entertaining set by Trombonium Sinfonium, a low brass ensemble from Greenville, TX. A VERY special performance was presented on the cafe deck by Nick and Amber, a young brother and sister act who blew the crowd away with their renditions of traditional swing tunes. The audience got funky with Rhythm Congress, making its sixth straight appearance in TCMF, with horn section that grew to seven before the set had ended. Dr. Tom Husak and the ACC Jazz Ensemble followed, and the evening was closed by The Skylarks and Charanga Cakewalk, who got everybody dancing and jumping! TCMF continues on Sunday with a terrific lineup of big band jazz ensembles followed by three of Austin’s most prolific concert bands; Austin Symphonic Band, Band of the Hills and the Austin Civic Wind Ensemble. Check the schedule page for times and performers for all future dates. Texas Community Festival is hosted by the Austin Civic Wind Ensemble and Central Market and sponsored by H-E-B and Strait Music Company.